College student Nicole Werner died in car accident. Her boyfriend, Craig, was driving but he wasn't charged with a crime. It was deemed an accident. Now a year later, Craig is back at the same college despite the objections of Nicole's sorority sisters. Shelly, the first witness at the accident scene, is also still living in the area. She has been trying for a year to get the newspapers to correct their inaccurate accounts of the accident, but has been unsuccessful. And Craig's roommate Perry, who has enrolled in a course about death, tells his professor he sees Nicole walking around on campus long after her death. 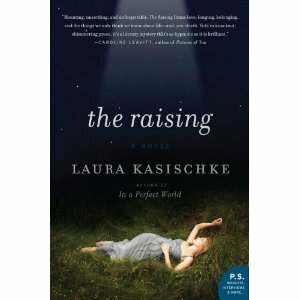 In The Raising , Laura Kasischke fluctuates between the past and present, revealing bits and pieces of the characters' lives before the accident, while also showing how each of them is dealing with Nicole's death. There is a shroud of mystery about what really happened at the accident site. Why do the newspapers report about Nicole's bloody body when Shelly, who witnessed the accident, didn't see any blood? And why does Perry think he's seeing Nicole walking around on campus? While Kasischke examines the students involved with Nicole, she also tells the story of Shelly, the witness who finds herself in hot water when she gets involved with one of Nicole's former sorority sisters. And there's Mira, the professor who works with Perry to research Nicole's death, while in the midst of serious marital issues. I read The Raising because it's my book club's June selection. I don't think I would have chosen to read it otherwise, and I have to say I did not enjoy it. While I liked the author's writing enough to possibly try another novel of hers in the future, I didn't like this story. It was quite honestly way too unrealistic for me. I'm not a big fan of books that get into supernatural ideas for the most part. And the fact that the police, school officials and even the FBI didn't manage to look into things more deeply seemed completely outlandish. Perhaps she shouldn't have mentioned the FBI and I may have been able to believe it. But that was a bit too much. I also didn't care for any of the characters. Mira was probably the one I could identify with most as she's a mother but she was dealing with a lot of issues as the primary breadwinner in her home with a husband who was having a bit of a breakdown. Even with all this drama, I didn't feel a connection to her. Shelly was a more interesting character, but even her choices seemed a bit odd. And I certainly didn't feel anything for any of the college students in the story. I do think this will make for an interesting discussion during book club about sororities, including hazing, school support and coverups of hazing, attitudes of sorority sisters, etc. I'll be interested to see if there's a difference in how people feel about the book based on whether they were in a sorority or not. I was not and couldn't identify with any of the sorority stuff going on. I agreed with Craig for the most part ~ I could never put up with all the sorority rituals and requirements! Overall, I think many of the readers of this blog may actually enjoy this book, but it was definitely not for me. This review was written based on a copy of The Raising that I borrowed from the library.